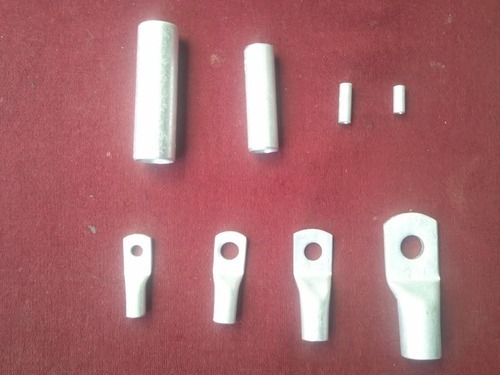 Being a well established-organization, we are engaged in providing a distinguished range of Aluminum Tubular Terminal Ends. Energy Tech India manufactures premium quality transformer parts that are made out of brass aluminum or copper as per the ISS. Drawing ,Samples,Detailed sketch or specification provided by the customer exactly as per their requirements.We offer our customers the best quality transformer parts,which is precision engineered at our manufacturing unit. Our product is offered at competitive rates to our clients spread across the India. Company is registered in MSME Industrial Department & Other associated Govt. departments. Power Transformer Technology provides a wide range of high quality Transformer parts that is highly valued in the markets. PTT range of Transformer Parts includes all type of fittings like Copper, Brass or aluminum member, breather, arcing horns, M.S. clamp, oil gauge, connectors, Insulating Sleeving etc. PTT Power/Distribution Transformer Parts are manufactured from the finest quality raw materials under strict quality control.Power Transformer Technology is professionally managed organization promoted by highly experienced ,well qualified professional in transformer manufacturing industry. Presently , we are well renowned as one of the key Transformer Spare parts Suppliers based in the NCR at Meerut about 60 KM from New Delhi. Power Transformer Technology supplies transformer parts in Govt. Departments,Semi Govt. Public Sector & reputed private transformer manufactures & repairs. Power Transformer Technology believes in leveraging technology to achieve a competitive edge. We believes that through Flexibility and adaptability to the customer requirements, PTT strength lies in its manufacturing and strong distribution network that spans across India. The company products are sold through an extensive network of dealers and branches, which are supported by our professional marketing team. The main goal of the company has been to create and maintain the highest level of satisfaction amongst its valued customers, offering an excellent quality product.